Today we have a guest post from Colette Salyk. Colette is the Leo Goldberg Postdoctoral Fellow at the National Optical Astronomy Observatory in Tucson, Arizona. She studies the evolution and chemistry of protoplanetary disks (the birthplace of planets) using a variety of ground and space-based telescopes. 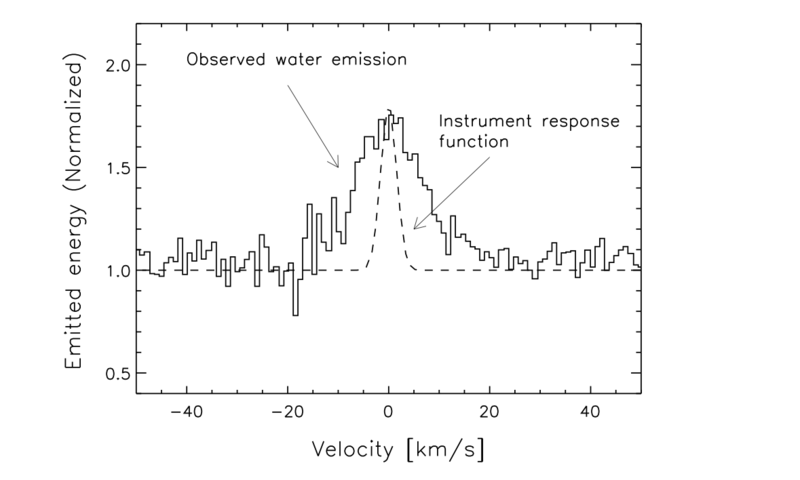 In the figure below, I’ve reproduced the observed water emission line that I discussed in my first post, but have converted wavelength to velocity using the Doppler shift equation, (λ−λ0)/λ0 = v/c , and centered the line at zero velocity. Note that in the first post, I focused on the shift of the entire line relative to the theoretical line center; here I am repositioning the line to account for this new center, and we’ll be discussing Doppler shifts relative to this new center. Although molecules emit/absorb at very specific wavelengths, the water vapor emission line we observed is clearly not thin and pointy. Instead, it has a rounded shape — something we refer to as “line broadening.” This broadening occurs for all spectra, due to two reasons. One reason is that the instrument optics always blur out the signal somewhat — this is called the “instrument response function.” The other reason is that the molecules themselves are always moving, and the motion of each molecule produces a Doppler shift. Collectively, they produce emission at a range of wavelengths. In our case, the instrument response function (plotted in the figure) is much narrower than our line. Therefore, the broadening is dominated by the motion of the molecules. The molecules are moving around due to a variety of reasons, including bouncing around due to their temperature, being kicked around by turbulence, and being in orbit around the star. The last effect dominates in our case, and I’m going to focus on that motion in this post. A simple example that may help you picture how orbital motion broadens the emission line is to consider a thin ring of molecules orbiting a star, oriented edge-on to our view. The molecules on one side of the star are moving away from us, and are redshifted; the molecules on the other side are moving towards us and are blueshifted. The amount of Doppler shift also depends on the orientation of the motion — as we examine parts of the ring that appear “closer” to the star from our point of view, we see progressively more transerve motion, and progressively less radial (and therefore Doppler shift-producing) motion. This collection of Doppler shifts turns a thin theoretical emission line into something broader, with symmetric blueshifted and redshifted components. How fast are the molecules moving in the disk as they orbit their host star? If you’ve taken Astronomy 101, you’ve probably heard of Kepler’s laws — they are a set of relatively simple rules that dictate how the planets of the solar system orbit around the sun. Kepler’s third law relates the period (P) and semi-major axis (a) of planetary orbits, stating that P^2 ∝ a^3. Alternatively, astronomers often convert period to velocity (using v = 2πa/P), and put in the correct constants so that the law applies to stars of all masses (not just ones like the sun), to obtain: v = sqrt(GM⋆/a), where G is the gravitational constant and M⋆ is the mass of the star. This is a very powerful statement, because it means that we can directly relate velocity (v) to distance from the star (a). Since we can use the Doppler shift to measure velocity, we can therefore use the line broadening to measure the location of the molecules. In contrast to the simple ring example I gave above, real emission lines originate from a range of disk radii, and the amount of light emitted at each radius also depends on the temperature and density of molecules. Also, the line width depends on how inclined the disk is with respect to our view. The figure below shows example emission lines originating from a disk where I’ve assumed the molecules are located between two radii, Rin and Rout, and that the disk is inclined by 30°. Have a look at the plots to see how the line shape depends on both Rin and Rout. What I find especially cool about this technique is that it works especially well when the molecules are at small radii. 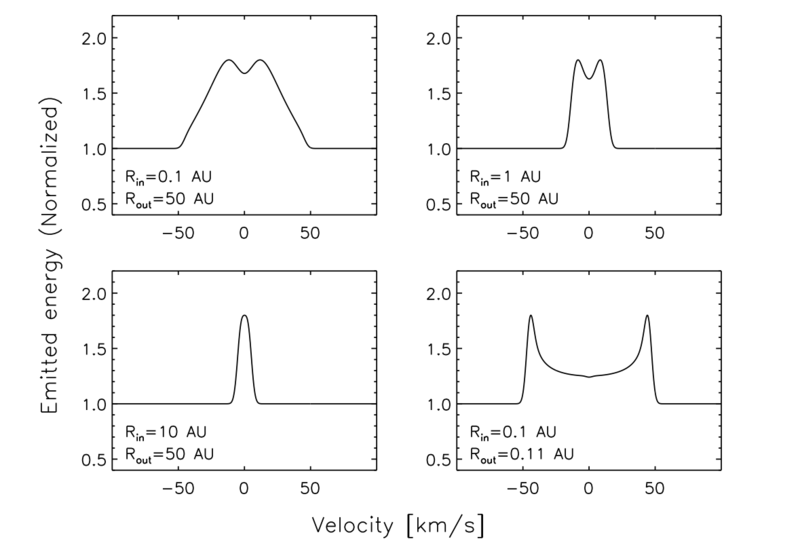 For example, it’s really easy to tell the difference between molecules located at 0.1 AU vs. molecules located at 1 AU! It’s not currently possible to obtain this kind of detailed spatial information through imaging alone, and so we sometimes say that we’re achieving “super-resolution”. I think this is a neat parallel to the Kepler mission, in which the transit observations are used to obtain detailed information about the sizes and orbital radii of planets, even though we cannot directly image the planets. Now some questions for you. Have a look at the detected water emission line in the first figure. Assuming this disk is inclined by 30°, as I assumed in my models, where do you think the molecules are located in this disk?